The wait is over. Eric Surface, Owner/Brewmaster of Mt. Tabor Brewing opened his doors last Friday night for his highly anticipated relocation project from Portland where he originally was brewing beer at Mt. Tabor. Information about Mt. Tabor can be found HERE. Mt. Tabor is actually a volcanic cinder cone. Eric plans on having his first beer in the new 7 bbl system soon, perhaps November he hopes. He is working on the final touches, as getting the ball rolling is quite the difficult task. The beers we enjoyed last Friday night were brewed at the very close Salmon Creek brewpub, and on Eric's smaller nano setup. True, only 2 beers were available, but they were quite good, and just teasing the lot of us for future styles Eric plans to brew. I was able to rush over after work, and got to the pub and tasting room shorty after the 4pm opening time. 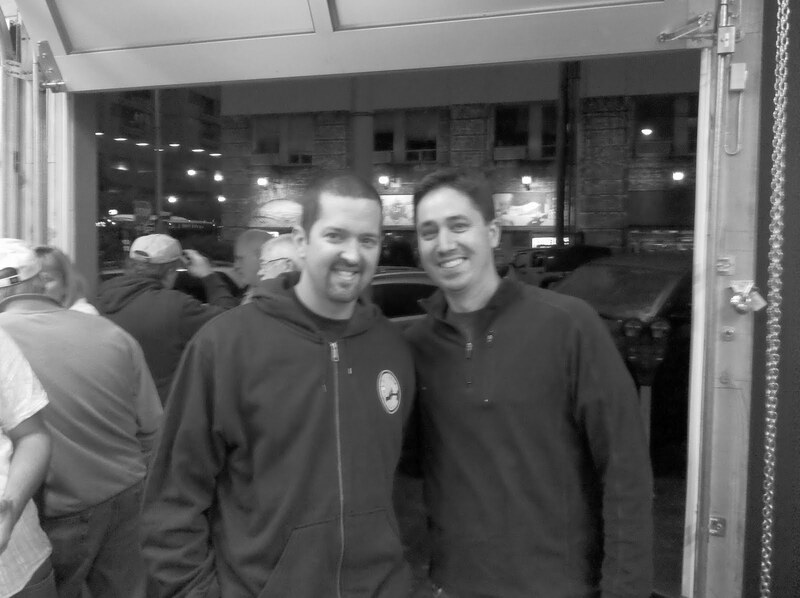 Eric stated there was a line down the sidewalk of some very thirsty locals and patrons. He shredded the paper off the windows, and fired up the taps right away with some very good help behind the bar (including fellow #pdxbeergeeks Duke Geren!). Glassware was still lacking, but the plastic still held a good pint which sold for $4.00 of the Asylum Ave. IPA (which was very limited and blew rather quickly) and the P5 Pale ale which was my favorite of the two. Both quite fresh tasting, and full of the good northwest hops which almost all of us love. It was nice to see some other #PDXBeerGeeks at the event and local business owners enjoying the goods. Angelo of BREWPUBLIC attended and as usual was great to have some beer geek discussions. Also Portland's 'The Commons' (formerly Beetje) Brewmaster Michael Wright was there, and also filled me in a little on his work, and plans with his new location. He seems to be in the same phases as Mt. 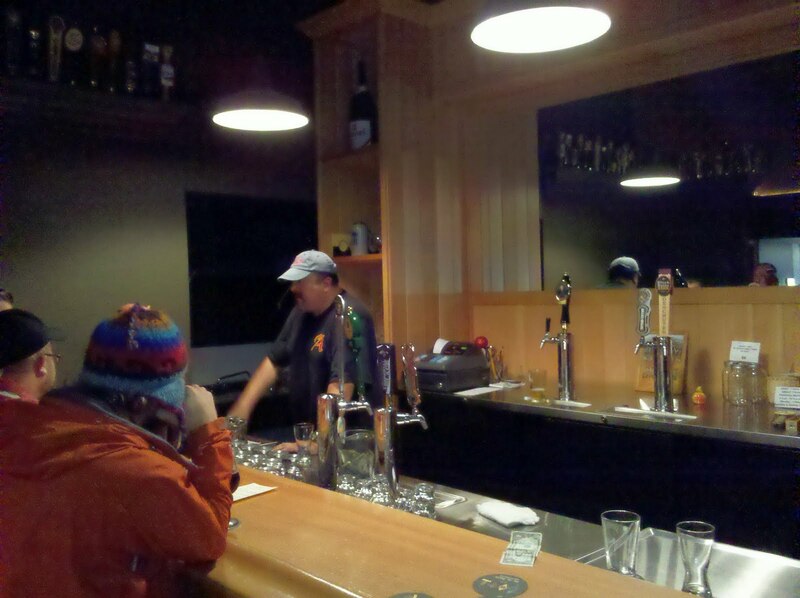 Tabor, but still a little ways off to have a functioning tasting room. Vancouver is in great need of some new and tasty craft brewers. Certainly Salmon Creek Brewpub has its place in Vancouver's beer arena, and Larry brews a mean beer and serves up some great food. I really love the fried mushrooms as well. Right next door to Salmon Creek Brewpub (which is only 1 block/street north of Mt. 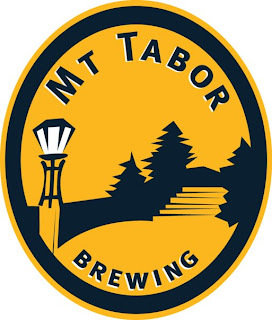 Tabor Brewing) is the well known By The Bottle. Soon close by, a new nano called Loowit Brewing will pop up somewhere soon as well. Plus others in Vancouver such as Heathen Brewing. I see some serious growth happening here in Vancouver where I currently live. I attempt to blog more about what is happening above Portland, and not actually in it. 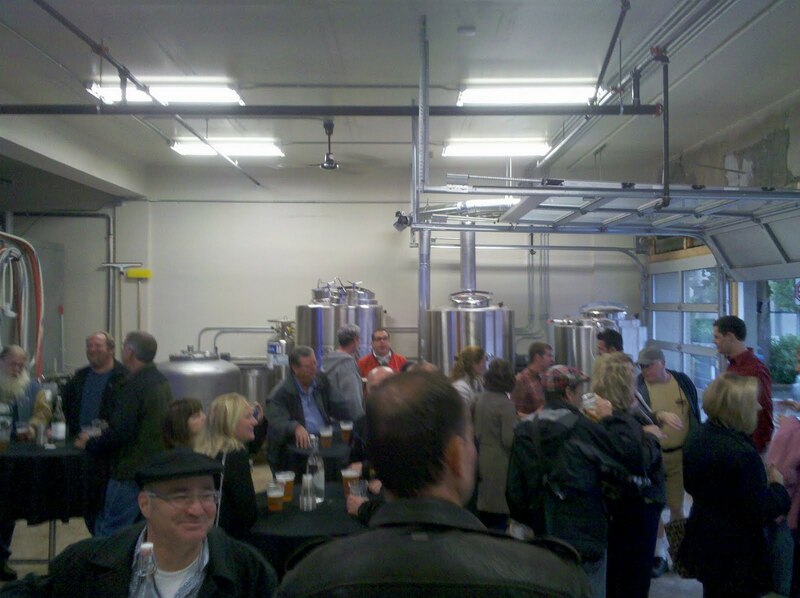 Though that is difficult since Portland's beer scene is huge, and well known around the country. Having 53 breweries within the city certainly helps. It will be nice to see Vancouver hit some high numbers and perhaps make a spot on the map like it used to have so many years ago. At 8pm, a band setup inside the tasting room. Just that by itself was quite the task since the place was so packed. Also at 8pm, a march over to Mt. Tabor organized by Co-owner Arlene of By The Bottle took place. I was kind of working backwards and just arrived at By The Bottle when the mass of people left. 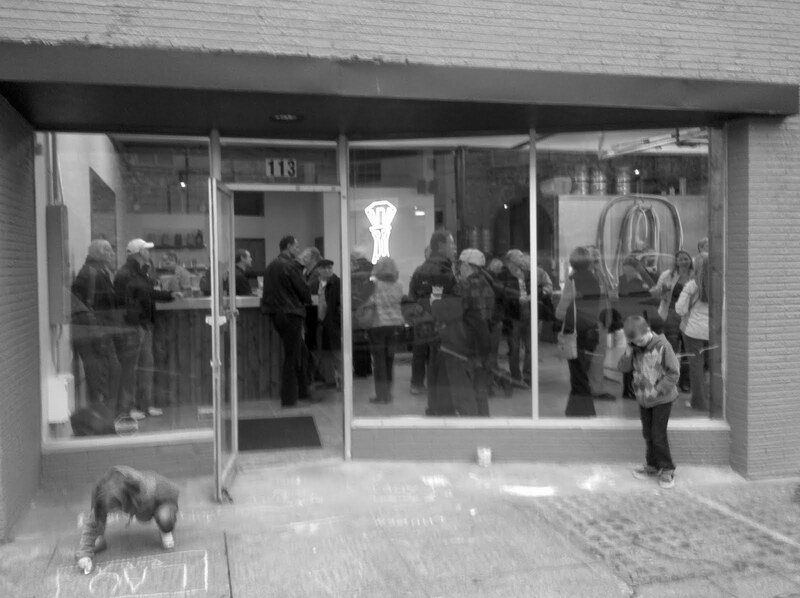 At that time fellow #pdxbeergeeks co-founder Michael and I stated that it would be funny to see that group of people fit into the tasting room. 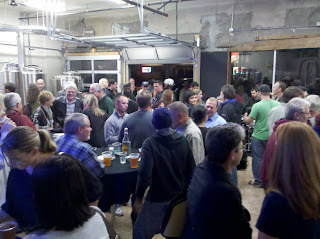 Not that the tasting room was small, but the fact that so many people attended. It was quite the turnout. Also fellow #pdxbeergeeks co-founder Emily Engdahl made a showing to support the grand opening of Mt. Tabor as well. 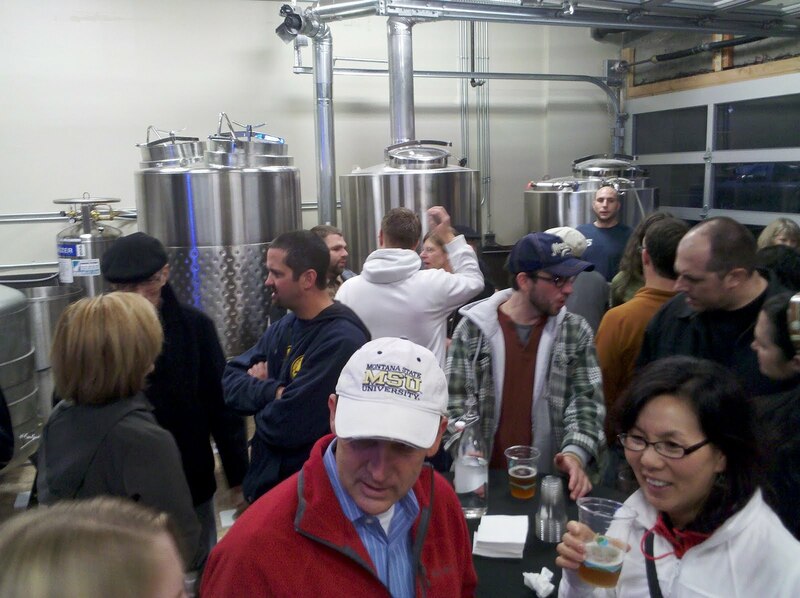 It was very cool for local PDX'ers to pop up north and show the craftbeer love. Eric Surface was great to talk to, and seemed very excited to see all the love of his very hard work. The tasting room open on Fridays only, 4pm-Close. He will focus on brewing, and distribution around town to some favored grub spots and taps. He should eventually have some stouts, and others soon once the larger system is up and going. Be sure to stop in there and check the place out!